1) Mobile matters, a lot. I mentioned in my What Just Happened post that mobile is starting to really impact the enterprise software business. At Work Market, the freelancers want to get work, accept work, and close out work on their phones. So mobile app development has become a huge part of what the Work Market engineering team has to work on. At some point, the enterprise will likely want to issue work orders on their phones too. 2) Freemium and transactional business models work in the enterprise just as well as they work in consumer. 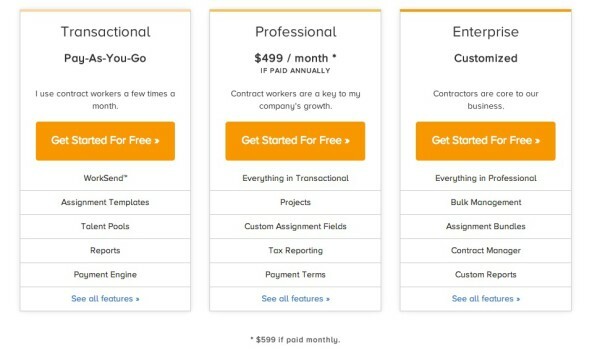 Work Market has a free tier with a transactional revenue model for enterprises that want to try the system or plan to be an occasional user. We know that “freemium SAAS” works well for horizontal enterprise applications like Dropbox, Slack, Google Apps, etc and I believe we will start seeing freemium SAAS models applied to vertical applications as well. We already are. 3) Enterprise applications must also be platforms if they want to scale into the largest enterprises. Salesforce is the poster child for this trend. They have become a very powerful platform and distribution partner for SAAS applications. But every SAAS application should have APIs that allow their users to plug enterprise software together. Work Market can talk to the other large applications that enterprises use for managing talent (HR, VMS, etc) and that is a requirement for the largest deals. It will soon be a requirement for all deals. I am seeing a bunch of new SAAS companies get started whose entire value proposition is building on the open APIs that most enterprise SAAS products have released in the past few years. If you are in finance, or HR, or marketing, or sales, you are now using a host of SAAS applications to get your job done and a big trend in the market is new applications that tie all of those together (via APIs) so that you can have a single view into your workflows. This is the “platformization” of SAAS and it is upon us. The big takeaway for me is that all the things we have seen happen in consumer web and mobile software are happening in the enterprise and the impact of that is already being felt. I am seeing it up close at Work Market and fortunately they got started recently enough that they have been able to take advantage of all of these trends (marketplaces, mobile, cloud, freemium, platform) as they go to market and build their business. That is, among many other reasons, why we recently led a growth round to help Work Market’s new CEO, Stephen DeWitt, scale into the freelance management system market opportunity that they created a few years ago.